Wolf Spiders are hairy hunting spiders in the worldwide family Lycosidae (Lykos is Greek for "wolf"), and these common spiders can be found in a wide variety of habitats. Although Wolf Spiders can be of any size, many of them are quite large, up to 1 1/3 inches (3.4 cm) long or more. Large Wolf Spiders are very common here in the Sonoran Desert, where they are sometimes mistaken for some of our other large spiders like Giant Crab Spiders (Olios spp.) or Tarantulas (Family Theraphosidae). I observed this large female Wolf Spider on the outside of my house one summer evening here in Tucson, Arizona. The furry lumps on this spider's abdomen are actually her many spiderlings (baby spiders). A female Wolf Spider will wrap her eggs in a silken cocoon and then carry it around with her until the eggs hatch. 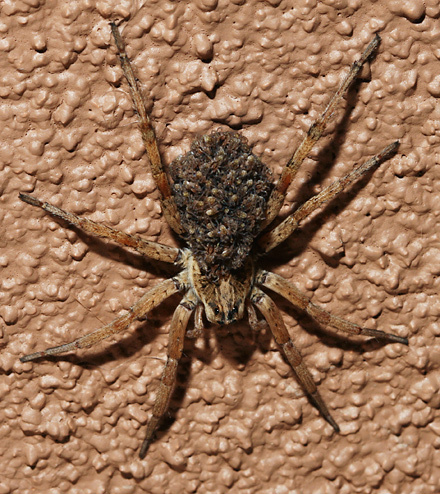 The newly hatched spiderlings will then climb onto their mother's back and ride around for a short period until they either climb or fall off and are dispersed. Wolf Spiders are typically cryptically patterned in a brown or gray color with a lighter-colored stripe down their cephalothorax (head and thorax). They have eight eyes in rows of 4, 2, and 2 and large, fang-like mouthparts called chelicerae that they use to masticate (chew up) their prey as they feed. Wolf Spiders feed on other invertebrates, and except for Funnel-Web Wolf Spiders (Subfamily Hippasinae), they do not build webs. Instead, Wolf Spiders are active, fast-moving, visual hunters and will stalk, ambush, and chase their invertebrate prey. Wolf Spiders are nocturnal predators and have excellent nighttime vision due to the light-reflecting crystalline tapetum layer in their large eyes. 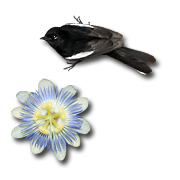 This light-reflecting layer gives them a whitish blue or green eyeshine, which you may be able to see at night if you crouch down and shine your flashlight across a patch of grass or fallen leaves. Although some can grow to an alarming size and are occasionally found inside houses, Wolf Spiders are not poisonous or aggressive towards humans, but they may bite if handled. Wolf Spiders generally flee from humans, but I did once have a huge one crawl up my pant leg (shudder) as I sat watching television. Thankfully, the Wolf Spider didn't bite me when I flicked it off, and as I ran shrieking from the room, I saw the equally terrified spider galloping off in the other direction. I have arachnophobia, and this sort of thing is the stuff of nightmares for someone like me. Despite this one bad experience, I try never to kill Wolf Spiders, especially the large ones, because they are highly beneficial in helping control filthy and annoying insect pests like cockroaches.